Set of 4 Replacement Casters for CUZZI Desks w/ Metric Threaded Bolt M8 x 12mm. 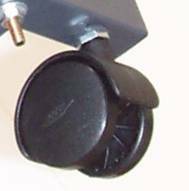 These are replacement casters with metric stems sold exclusively for CUZZI computer desks or any item with a metric stem m8 x 1.25 pitch. + $15.00 Shipping (Ground U.S. contiguous U.S.). 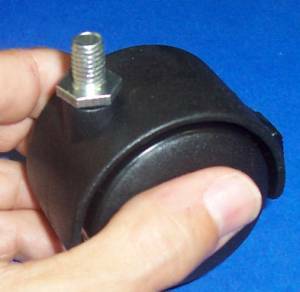 Standard furniture casters will not fit into the threaded nuts of CUZZI branded desks, as these nuts have metric threads (not U.S. standard). * Casters are sold in sets of 4. The price is for the set. The set includes 2 casters with locks (breaks) and 2 casters without locks. b) Small = 41 mm (1 5/8"), for some batches of modelSTS-7801, S-4739, STAK47. Be sure to measure the diameter of your requirement before ordering. Only measure the wheel diameter itself, not the wheel's circumference, the cover or the stem. Simply make your selection between Large or Small when ordering, by using the drop down menu. Please call us for all your inquires at (321) 303-9598.